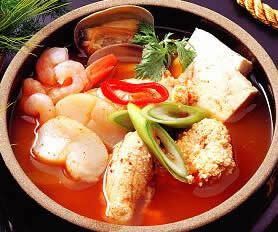 Al chigae is a fish egg casserole dish which contains tofu and assortment of vegetables in a refreshing, spicy broth. The main ingredient is its fresh fish roe, usually from Codfish, which is deep and rich in flavor as well as texture. Assortment of vegetables usually include enoki mushrooms, zucchini, green onions, green/red chili peppers and it is normally served in a ceramic bowl (ddukbaegi) which continues to heat the stew during consumption. Many enjoy this meal with a bowl of bop or steamed rice to balance its spiciness. Other side dishes can be found along with this meal but eating it alone with rice will surely satisfy your hunger. In a pot, fill enough water to cover the whole block of tofu and bring it to boil. In a saucepan, over medium heat, add sesame oil, green onion, garlic, and Korean red chili pepper powder. Cook until garlic is fragrant, but not brown. Cook for an additional 5 minutes, then add tofu. Continue cooking until tofu is warmed through for approximately 3 minutes.